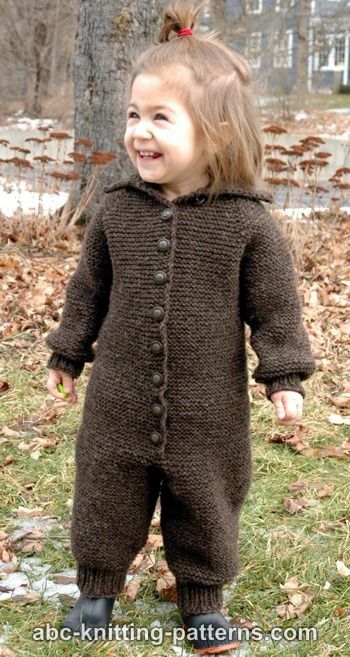 If you're looking to make a nice, thick, woolen romper, this is the pattern for you. 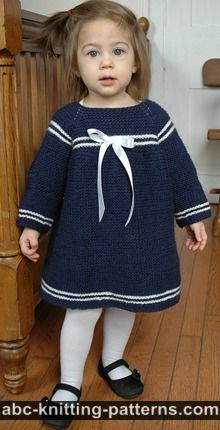 Knitted with garter stitch, it feels very solid and is excellent for cold weather. The shoulders are raglan-style for a smooth, comfortable fit. 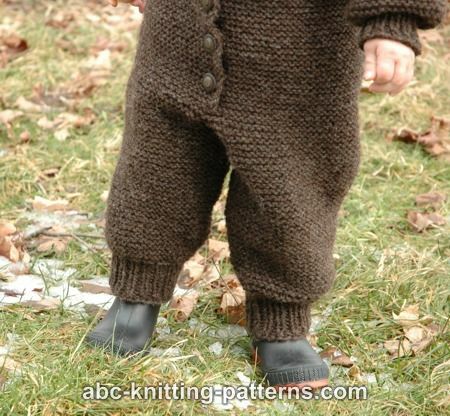 A note on knitting rompers for babies: the crucial dimension for fit is the length of the body (center neck back to crotch). 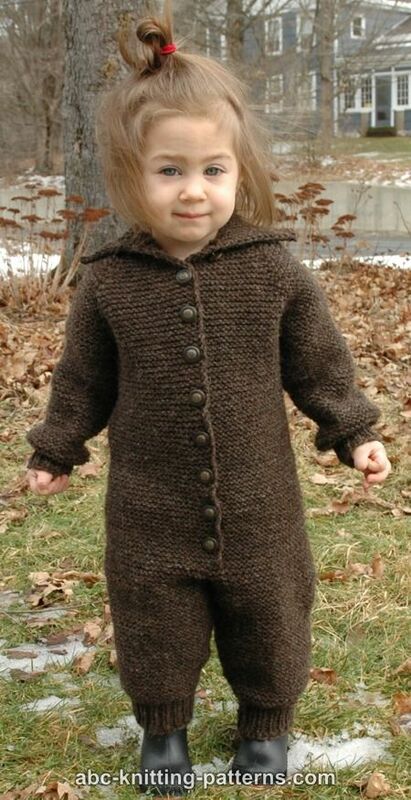 Make this slightly longer than needed so as to ensure the romper fits all season long -- kids at this age grow fast! Shown in size 24 with 3 inches of positive ease. Needles: US 5 (3.75 mm) circular needles OR SIZE NEEDED TO OBTAIN GAUGE. 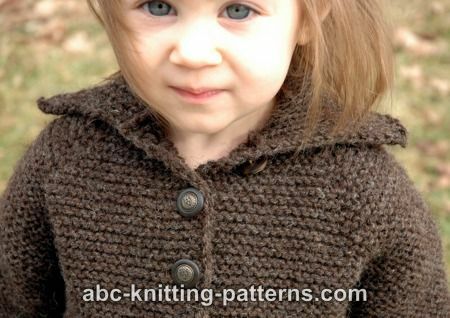 For the sleeves, I use the “magic loop” method and 32” circular needles. You can also use dpn. The romper is worked top-down in garter st. 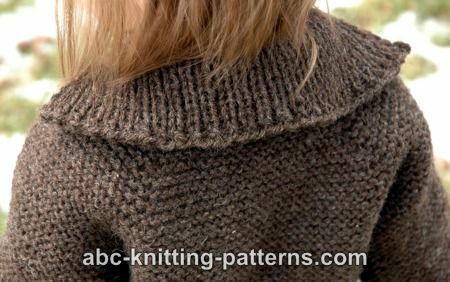 The yoke is worked back and forth with raglan sleeves. The body is worked back and forth, and then in the round. 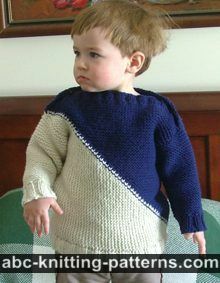 The sleeves and the legs are worked in the round. Raglan increases are worked with M1 increases before and after the marked raglan stitches in each right side (RS) row, thus the number of stitches in each RS row is increased by 8. Selvedge stitches are worked in the following way: slip the first stitch in a row, purl the last one. Cast on 51 stitches and knit 1 row. Row 1 (RS) and all odd rows: knit making M 1 increases before and after the raglan sts. In this way you increase the number of stitches in every odd row by 8. Row 2 (WS) and all even rows:s knit. Work 40 (44, 46, 48) rows as established. Increase 4 (4, 5, 6) times in every second row. Increase 8 (9, 9, 9) times in every 4th row. Starting from row 5, work 3 button band sts: k1, yo, k2tog. Work next button hole every 16 rows (8 ridges). Row 41 (45, 47, 49): work left front sts + raglan st, transfer left sleeve sts to a piece of waste yarn, cast on 4 sts for underarm, work back sts + 2 raglan st, transfer right sleeve sts to a piece of waste yarn, cast on 4 sts for underarm, work right front sts + 1 raglan st. Continue to work in garter st back and forth. Work 80 (92, 104, 108) rows. Next row: Work this row as established, till the last 4 stitches, transfer the last 4 sts of the button band to a spare needle, position it over the beginning 4 sts of the button band, left and spare needle in left hand. Insert the right needle in the first stitch on the spare needle, then in the first stitch on the left needle and knit both sts together. Repeat with the remaining 3 sts. Place a marker in the middle of the button band - there should be 2 button-band sts before the marker, and 2 sts after the marker. Count the stitches you have on your needle now, and place another marker halfway. This will be the back center st.
Continue to work garter st in rounds. needles (using "magic loop" method). Place marker after the 1st cast-on st.
Work 70 (78, 88, 98) rounds or to desired length, keeping in mind that the last 12 rounds of rib, described below, will add about 2” (5 cm) to the length of the leg. In the last round before the rib work *k1, k2tog to the end of the round. AT THE SAME TIME decrease by 1 st at the marker in every 6th round. Work decreases till the beginning of the rib. Work 12 rounds of rib 1x1. Bind off. Transfer stitches from the length of yarn, cast on 3 (3, 5, 5, 7) st with single cast on, join and continue to work the leg in rounds the same way as the first leg. 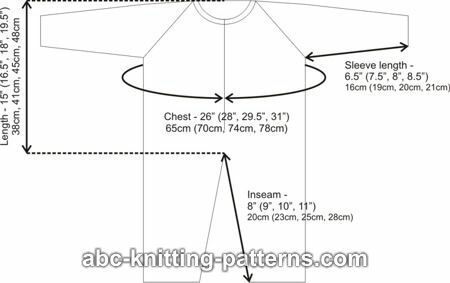 Transfer sleeve sts to circular needles, pu&k 4 sts underarm. Place marker to mark the beginning of the round. Work 66 (76, 80, 86) rounds. Decrease by 1 st in every 6th round in the middle of the underarm sts (place another marker there). Total 5 times. 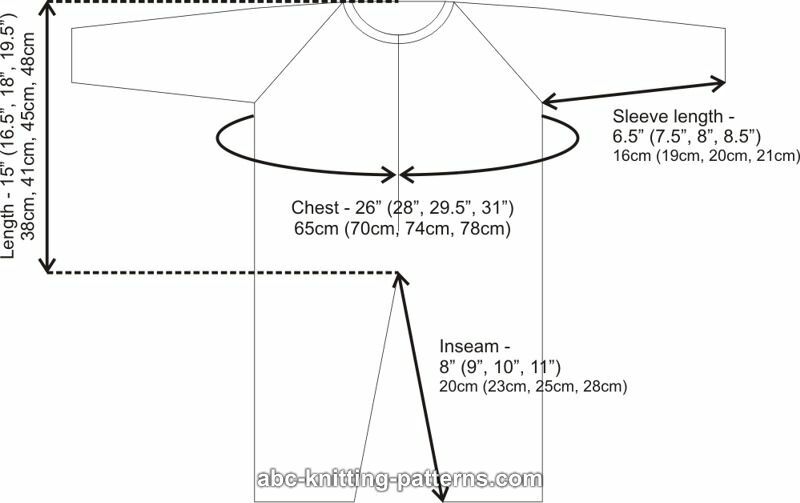 If you would like to change the sleeve length, do it at this point, keeping in mind that the last 12 rounds of rib, below, will add about 2” (5 cm) to the length of the sleeve. In the last round before rib work *k 1, k2tog to the end of the round. Pu&k 51 st along the neckline and work 22 rows of rib 1x1. 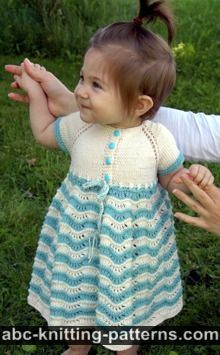 If you would like to button the collar, make button holes at rows 9 and 17, by working yo, k2tog on the same side as the button holes on the body of the romper. Bind off. Weave in ends. Sew on buttons.